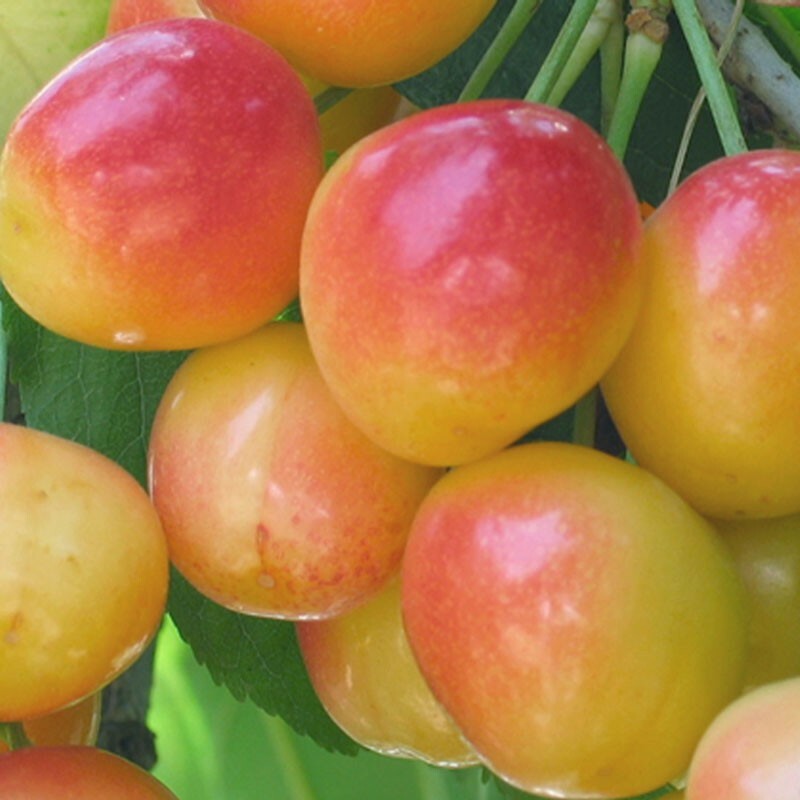 Considered the sweetest of all cherries and certainly one of my favorites, yummy Rainier cherries are recognized by their yellow skin with a scarlet blush. They are a cross between the Bing and Van cultivars and were developed in 1952 at Washington State University by a scientist named Harold Fogle. Their name pays homage to Washington State’s tallest mountain, majestic Mt. Rainier at 14,409 ft.
On March 1, Hubby and I celebrated a new month by buying a semi-dwarf Rainier cherry tree or Prunus avium ‘Rainier’ from one of our favorite local nurseries. 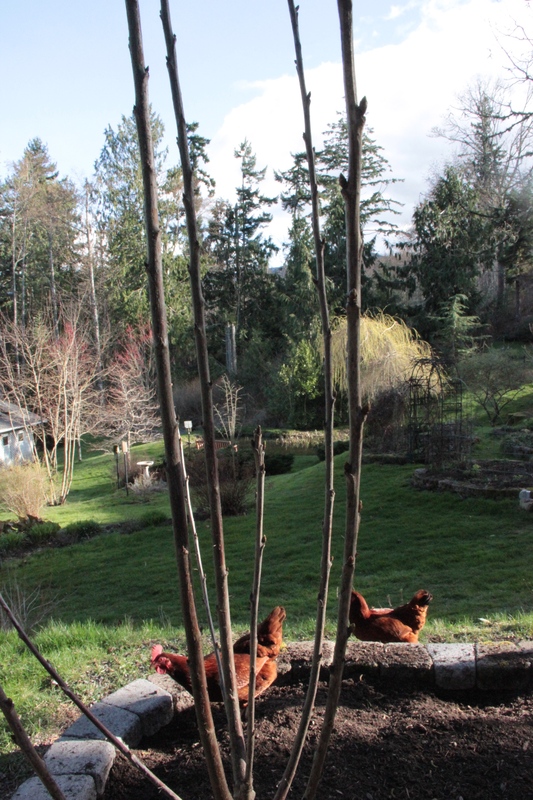 We discussed purchasing a Lapins cherry tree, but ended up selecting the Rainier and planted it as an anchor in the new bed by the chicken mansion. One plus: The size of our new tree allows for simpler netting to ward off birds. It joins the full-size (over 25′) sour cherry growing down in the orchard which we are almost certain is a Montmorency. We’re prepared to shop for another cherry tree for pollination purposes or just may live dangerously and see what this first summer holds. Sometimes Rainier trees bear fruit without a designated pollinator, so since we have other possible pollinators near Coppertop, we will wait and see, prepared to buy a Bing or Lapins tree to plant in a spot nearby if needed. Perhaps we have a pie-in-the-sky hope — cherry pie, that is. 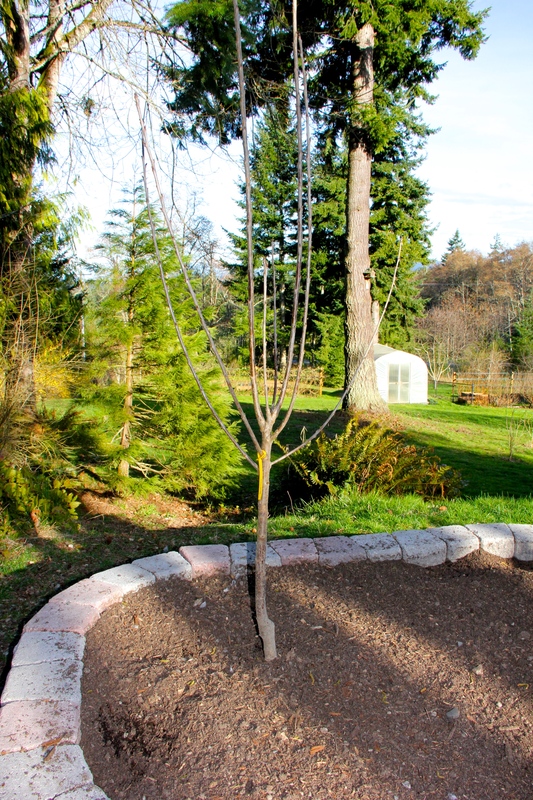 This entry was tagged chicken mansion, gardening, Lapins cherry, new bed, Olympic Peninsula, pollinator, Rainier cherry, Western Washington. Bookmark the permalink. Congrats on the new tree. I would like a dwarf cherry tree like that, but don’t they want full sun? I don’t really have enough sunny room. The cherries I’d like more for the cedar waxwings than myself. Wishing you many sweet cherries.